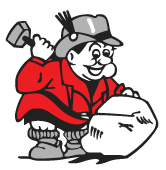 Hauenstein originated in New Ulm, Minnesota in 1864. Hauenstein was a popular local beer and flourished for over 100 years. As the years went by, the Hauenstein family was no longer able to compete in the changing beer industry and the Hauenstein label was sold to the Grain Belt Brewery in Minneapolis where it remained for a short time. 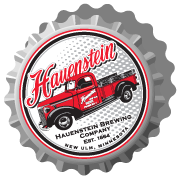 Hauenstein then was sold to the G. Heileman Brewery in La Crosse, Wisconsin. In 1990 Al and Rae Ann Arneson purchased the Hauenstein label and returned Hauenstein to its area of origin! Remarkably, Hauenstein has been able to maintain its positive reputation, quality and taste. 1940 original Hauenstein Chevrolet delivery truck…note #1 Phone number ~ Still phone #1 after all these years. Hauenstein is a rich full flavored legendary American Lager. 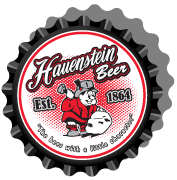 Hauenstein is enjoyed by all…from the up and coming college student to the seasoned beer drinkers who have not lost their sentimental taste for the authentic legacy beer. Hauenstein is often referred to as “the beer with a little character”. 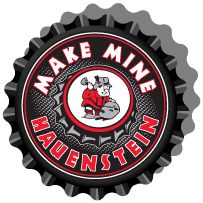 The trademarked slogan and the character have endeared beer consumers to the brand and many loyal followers have continued to enjoy Hauenstein to this day! 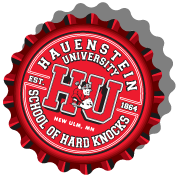 Hauenstein imbibers have earned the reputation as attendees of the “School of Hard Knocks” – “Hauenstein University”. This is exemplified by its history, the brand’s moves, and its enduring charm. Time, Faces, Places Change but Hauenstein Remains! 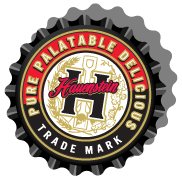 Hmmm. . .Hauenstein Has Been Enjoyed by a Variety of Characters since 1864. . . In keeping with tradition, say...'Make Mine Hauenstein' and enjoy!